Do you know the correct way to tie your shoes? It has been said that all I really need to know I learned in kindergarten , but I must have been absent the day shoelaces were being explained. Unfortunately it took until college for me to discover what I missed back then (See, Dad....all that money for college didn't going to waste!) Tie your shoes the correct way, and they stay tied. Make a seemingly minor change and you will forever be tripping over your laces. So what is the correct method? 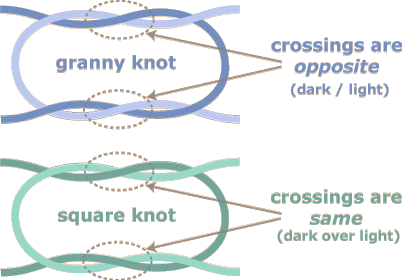 Well, it all boils down to the difference between the square knot and the granny knot. Now, I'm certainly no expert when it comes to knots, but thankfully I have a friend, Dave, who is a rock-climber. Seeing how he hasn't fallen to his death yet, I would imagine he knows a few things about tying proper knots. Anyhow, Dave explained that square knots are superior in their ability to stay tied. Based on his descriptions, I drew the diagrams below. The difference is very subtle to see. The key is to notice which strings overlap where. Further evidence in favor of the square knot (and the reason I even ran across it in the first place) came from the experiment presented by my inquisitive friend Bryce. It seems as though he had gotten tired of constantly re-tying his shoes and so he experimented with variations. Being the type not to finish until all the t's are crossed and i's are dotted, he actually walked around for 12 days with one shoe tied the old way and with the other shoe tied with a square knot. In that time, the granny knot required re-tying 14 times while the square knot never once came undone! So how can you determine which knot you are using? By staring at the diagram, it may not be immediately obvious how the knots relate to that funny looking jumble of string sitting on your shoe. To make things clearer, simply yank on the loops of the shoelaces until they come undone and you are left with a knot. Compare your knot to the ones above, and you will quickly discover whether you really learned all you need to know in kindergarten! Sometimes you can even tell at a glance which knot has been tied. Due to the structure of the granny knot, it tends to rotate the loops so as to align them with the length of your shoe while the square knot does not. Having thus discovered that I was tying my shoes the inferior way, I did the next obvious thing....I checked my friends' shoes to see who else skipped class back in kindergarten. Perhaps they had different reasons for missing that class, or perhaps I just hang out with the wrong crowd, but I quickly discovered I was not alone. Out of 13 people, only 3 used the strong square knot while 10 used the inferior granny knot. The final question which deserves answering here is what should be done if you belong among the 75% who uses the inferior granny knot. Well, don't despair as you don't need to take out extra accident insurance from tripping over those laces. To change from a granny knot to square knot, you need only switch the way you do the cross-over part before you do the loop part of tying your laces. If you normally cross the left lace over the right, then switch things around and cross the right lace over the left. Tying the loop part as before, you will have successfully changed the knot type and your laces will now stay tied much longer. *A shoe may not have laces if it is a sandal, slipper, or is some other footwear one slides on their foot. Likewise, there are other fastening methods (such as Velcro) that do not require shoelaces and therefore do not require a knot. If you loved/hated this page, or have any comments, please send e-mail to webmaster@shoeknots.com and I will personally respond. Please note that your privacy is very important to me. There is nothing I hate worse than spam and I will never use or release your information for any solicitation purposes. To learn more about the author of these pages, visit my homepage. Last updated July 09, 2008.